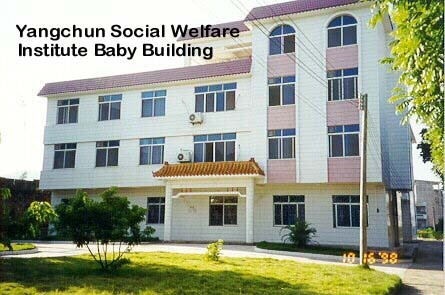 This site is dedicated to information about Yangchun City - especially information about the Social Welfare Institute and families blessed with children from Yangchun. You will find links to quite a few web sites about Yangchun. If you know of a link to share, please drop me an email. 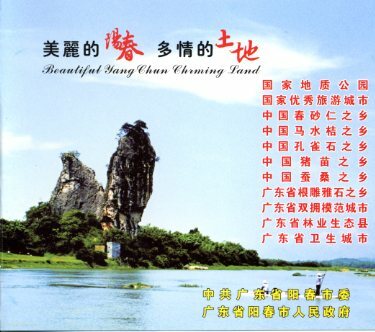 "Beautiful Yang Chun Charming Land" is the title of this promotional DVD about the Yangchun area - and it includes English captions! This is a rare find for a couple of reasons. In the past, when we've been fortunate enough to find Yangchun-related items for our families, they've included very little, if any, English translation. Providing even a partial translation for our families is difficult, time consuming and entails additional costs. Plus, it is very difficult to find Yangchun items in large enough quantities to offer them to our families. 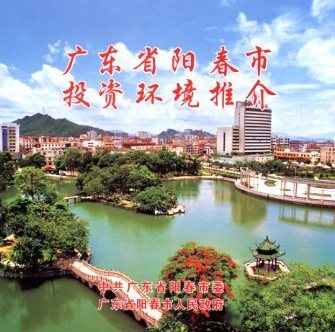 Items like this DVD are produced by the Yangchun government specifically for business conventions and trade fairs. They are not produced for sale to the general public, so it is almost impossible to purchase them. Some of our families have visited Yangchun and have been given wonderful Yangchun promotional items, but they are usually no longer available, or again, not available for sale in large quantities. Find out more about this DVD and get all the ordering information on the DVD web page. TRANSLATION NEEDS : We also have a few other items from Yangchun that we would like to offer with full or partial translations. We thank those who have donated translation services in the past and continue to do so. It is difficult work and we would like to make it easier by sharing the task among several volunteers. If you, or someone you know, would like to help us raise funds for the Yangchun Development Fund by providing some translation services, we would love to hear from you! We are so very grateful to those who have selflessly done this on behalf of the children still being cared for in Yangchun. We contine to need this help and appreciate it so much! If you can help out, please contact Linda Fielding. ** See the latest referrals from Yangchun! ** Meet many of the beautiful children from Yangchun! * Read all about the Yangchun Family Reunion at Snow Mountain Ranch, CO held August 4-6, 2000. This site contains photos of the big event. * See lots of photos of the new orphanage, the aunties, the babies, views around Yangchun, and the Golden Roc Hotel taken during the Egans' 1998, 1999 trips to Yangchun. Contact them for the link to view the photos taken during their 2001 trip. * More photos of children in the orphanage taken in June 1999. These were taken by Mrs. Yu for Kim Giombetti prior to her travel for daughter Elena. * More photos of children in the orphanage taken in 1999. These were taken by Mrs. Yu for the Buffons prior to their travel for daughter Katelin. * For information about the video "The Treasures of Yangchun" contact Betsy Egan. This video is comprised of footage taken in 1997, 1998, 1999 and 2000. 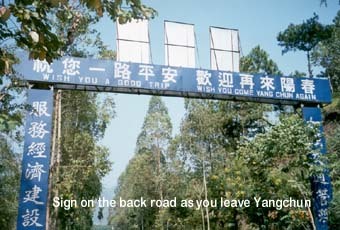 It is approximately one hour long and has scenes of the drive from Guangzhou to Yangchun; the babies and the aunties in the orphanage; scenes in and around Yangchun; the first Yangchun reunion held in 2000; and a photo gallery of over 100 beautiful children now home with their families. A VHS tape is $15 (including mailing cost) and $13 from each tape is placed in the Yangchun fund to be used for future orphanage projects. A DVD version is now available for $20 per copy.